These are the unanimous favorite at the family cookie bake every. single. year. If you make one new cookie recipe this Holiday season, this cookie should be it! Pro tip: they’re great dipped in coffee or hot chocolate! Set out 3 sticks of butter to soften at room temperature. In a large bowl, use a mixer to blend the softened butter with the 1 1/4 cups granulated sugar until creamy. Add eggs and vanilla, mix. In a separate medium bowl, use a fork to toss together the flour, baking powder, and salt. Add some of the flour mixture to the butter mixture, mixing well. Add the half and half and mix. Gradually add the rest of the mixture in, beating well after each addition. You will end up with a sticky dough. Cover the bowl of dough with plastic wrap and refrigerate for 30 minutes. During that time, prepare the glaze. In a small saucepan (stainless steel, if you have it), whisk the granulated sugar, water, and corn syrup together. Cook over medium heat, stirring until the mixture just comes to a boil. Remove the pan from the heat and stir in the vanilla. Let the mixture cool for five minutes. Preheat the oven to 350 degrees F. Line two sheet pans (four, if you have them) with parchment paper or lightly grease the pans with cooking spray. Place a few tablespoons of flour in a small bowl (for dusting your hands). When the dough is chilled, use two teaspoons or a scoop to measure out some dough. With floured hands, roll out the dough in a 2 inch ball and place it on the baking sheet. Continue scooping and rolling, dusting your hands each time. Place the cookies two inches apart on the pan. Refrigerate the dough whenever it gets too soft to work with. Bake the cookies at 350 degrees F for 10-15 minutes until the tops are set and the bottoms are lightly browned. Let the cookies rest for a couple of minutes before placing them on a cooling rack. When the cookies are completely cooled, you can glaze them. 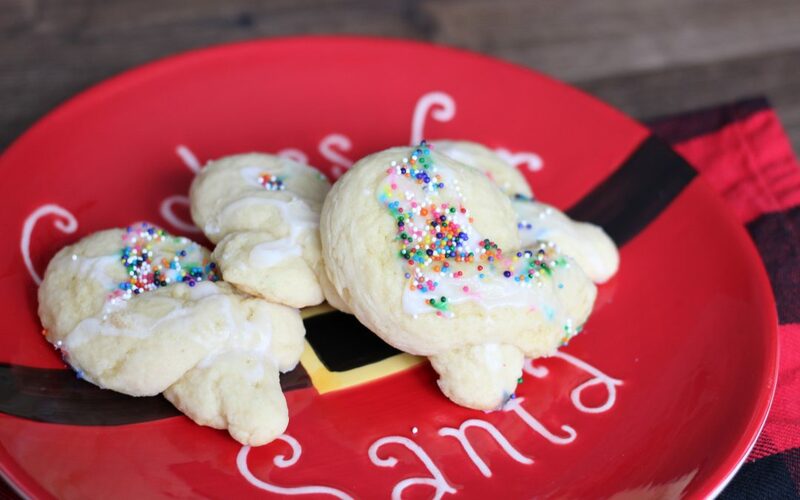 One at a time, you dip the cookies in the glaze and immediately decorate with sprinkles. (Do not put on too many or the sprinkles will bleed). Place the glazed cookies on a cooling rack and set it over a parchment-lined or wax-paper-lined pan to catch the drips. It will take about 4 hours for the glaze to fully dry, so wait to store or package the cookies. Once the glaze has dried, store the cookies covered at room temperature for up to a week. Note that if you want to use a plastic container, the cookies will become very moist. Any leftover glaze can be left at room temperature for three days, then refrigerate for a week. You can also freeze the glaze.